With THE AVENGERS being released this weekend, THOR was the last of the four prequels I needed to see in anticipation of the team movie. I was big on the IRON MAN movies and so-so on CAPTAIN AMERICA. THOR, largely because it had Kenneth Branagh directing, was the most intriguing of the bunch. I was never particularly engaged by the Thor comics, so I knew only the bare bones of his character going into this. I watched THOR (2011) on 5.3.12. It was my first viewing of the film. I can’t figure out why I like this considerably better than I did CAPTAIN AMERICA. Both try and wedge comic book reality into a real world environment (though certainly not to the extent Nolan has been doing with Batman), both have super-strong characters fighting at unrealistic levels, both are merely set-ups for the AVENGERS films. Yet where I felt CAPTAIN AMERICA was largely going through the motions, I liked what THOR brought to the table. 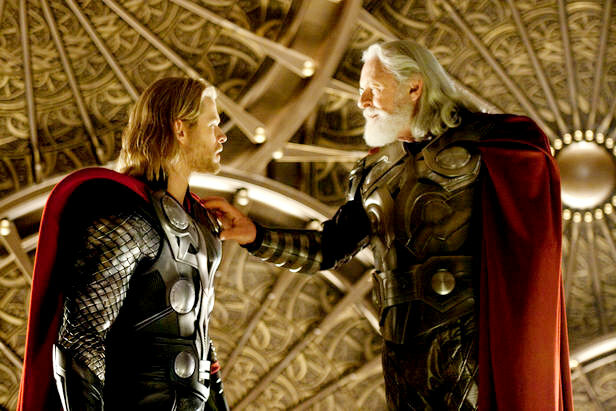 The first thirty minutes are spent on Thor’s home planet of Asgard before he is cast off to Earth by his father (Anthony Hopkins) in an attempt to make him find himself. Thor (Chris Hemsworth), then, is engaged in a fish-out-of-water scenario, with his powers striken from him. There is surprisingly little fighting in this. Four scenes in two hours, really. Most of it is (you might want to sit down before reading this…) character development and back story. Branagh does a really nice job balancing the fantastical Asgard and the real-world Earth. Yes, Asgard is entirely CGI, and yes that really annoyed me at the beginning. But because the Earth sequences felt much more grounded in reality, the juxtaposition worked for me. I know that may be inconsistent with my feelings on some previous CGI heavy movies, but the CGI stopped bothering me about ten minutes in. Hemsworth is surrounded by solid actors. Hopkins, Natalie Portman, Stellan Skarsgard, and Tom Hiddleston all do a nice job of fleshing out characters which should just be forgettable side-orders. Portman, especially, impresses. Not that this is her finest acting work, or that she is asked to do too much. But she and Hemsworth create a nice little chemistry, and (for the first time since the first Raimi SPIDER MAN movie) I really buy the girl-guy relationship. There’s no way I should feel this way. But when she kisses him at the end, I really buy it. Go figure. I couldn’t help but think of how much time Branagh must have spent on set dissecting the Shakespearian tie ins. The banishments, the father-son relationships, the family betrayals, the redemption stories, the tragedies, the bits for the groundlings, etc. Part of the reason this movie does well is that the entire movie does a nice job of finding the right balance between serious and fun. I read a snippet which noted that when Hopkins and Hemsworth first got into armor and met in one of the grand Asgard scenes he looked at Hemsworth and said something along the lines of ‘There’s really no acting required here, is there.’ And he’s right to a certain extent. The movie is nice to look at, the costumes are (in a way I still don’t fully fathom) not silly, and the movie just moves. I’m actually finding myself appreciating the aesthetic the more I write about it. So, look… this isn’t HAMLET. This isn’t some grand filmic achievement. Heck, when I get to the scores below, I might eventually rank it lower than THE SOCIAL NETWORK, which I had some major criticisms of. But THOR gets so much of what it wants to do right. I really can’t level many criticism at it. Do I wish more happened? Maybe. But despite having substantially less fighting than CAPTAIN AMERICA, it had substantially more substance. So rather than complaining, I’ll just let it be and get ready for THE AVENGERS! ~ by johnlink00 on May 4, 2012.